Reminder: A comment for consideration must be accompanied by your full name. First name only or a pseudonym is not normally accepted. Also, please limit your comment to 1,000 characters, which is twice that set by the St. Louis Post-Dispatch. Finally, avoid epithets and personal attacks. A retired Clayton resident and cigar smoker thinks it’s OK to pollute the outdoor air wherever he pleases, including city parks, and is venting his displeasure – as well as his cigar – on the City of Clayton for the modest first step it’s taken to curtail such pollution. 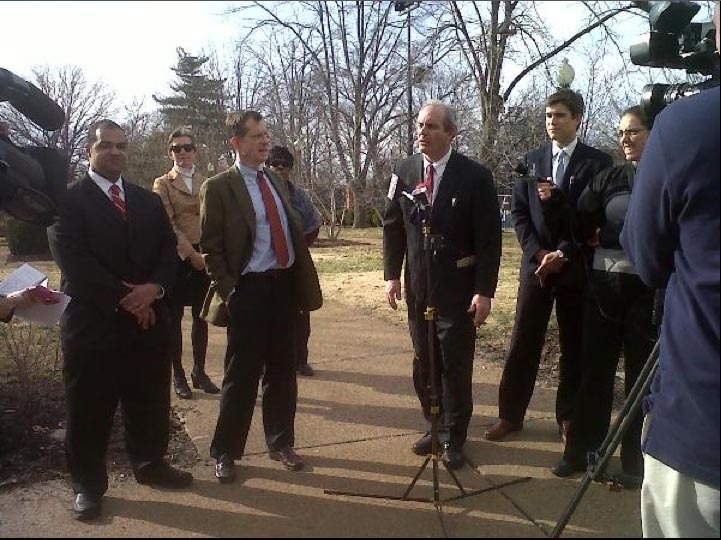 Clayton can take comfort from knowing that it’s not alone in trying to make it’s parks healthier places for the public. Americans for Nonsmokers Rights in Berkeley, Ca., lists no less than 478 other cities with such ordinances, two others in Missouri being Kahoka, county seat of Clark County, and Kirksville. This is a frivolous lawsuit by a cigar smoker with more money than sense. And the attorneys he’s retained, W. Bevis Schock and Hugh A. Eastwood, assisted by Washington University law graduate Russell Anhalt, clearly aren’t ashamed to take his money: it keeps them off the dole. Below is the text on the KMOV-TV Channel 4 website underneath the TV story, and following that a full transcript prepared by Missouri GASP. (KMOV) – A lawsuit has been filed against the City of Clayton for an ordinance recently passed that bans smoking in its city parks and garages. The lawsuit was filed by a Clayton resident. Arthur Gallagher says the ban is unlawful and denies him his constitutional rights. He is asking the court to declare invalid parts of the ordinance that ban outdoor smoking because they have no rational basis. Penalties for the ordinance carry up to a $1000 fine and 90 days in jail. The lawsuit is also filed against Clayton Mayor Linda Goldstein, City Manager Craig Owens, Parks Director Patty DeForrest and Police Chief Thomas J. Byrne, each in their official capacities only. (KMOV) – Anchor Vickie Newton in studio: Well, it’s a case that’s pitting smokers against city government. A lawsuit filed today alleges that the smoking ban in Clayton goes to far. 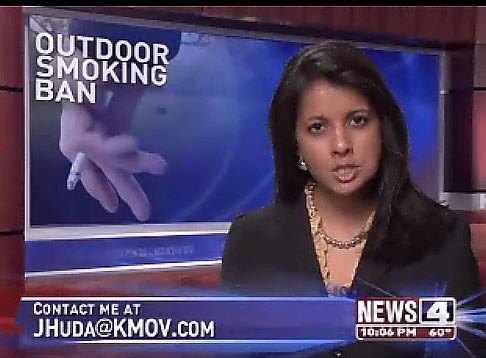 As News 4 Jasmine Huda tells us the big issue has to do with smoking in city parks. Jasmine Huda in the studio: That’s right, and this story is generating a heated discussion on our KMOV facebook page. The question is whether a smoking ban in city parks and other venues violates your rights. One man says that the answer is yes. Jasmine Huda (off camera): By night, the streets of Clayton were quiet, but earlier today one man was making a lot of noise. Reporter Jasmine Huda (off camera, with close up of cigar being held in hand): The answer is clear to this Clayton resident and the plaintiff in the lawsuit, Arthur Gallagher. 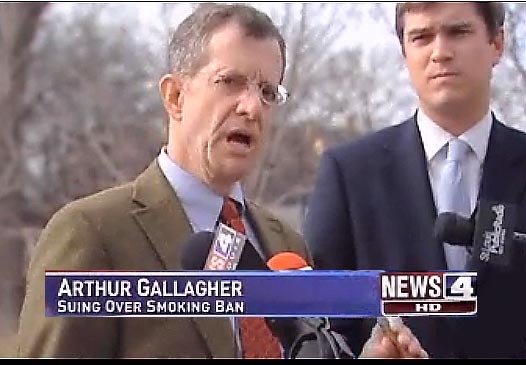 Gallagher and his attorneys say that smokers should be able to light up in places like Shaw Park. Jasmine Huda: Well, the City of Clayton issued this statement criticizing the methods used by the plaintiff’s attorney, noting that the attorney placed an advertisement seeking residents to serve as plaintiffs in this case. But it adds, the main purpose of the ordinance is to protect people and property, an argument that even some smokers buy. Jasmine Huda, interviewing a smoker: You smoke. Jasmine Huda: What are your thoughts on smoking in city parks? Jasmine Huda (off camera): For now, anyone caught smoking in city parks, garages, or other outdoor spots can be fined up to $1,000 and 90 days in jail. Jasmine Huda, News 4.
er, Mogasp, aren’t you being just a weeeee bit disingenuous when you call open air bans on smoking in parks a “modest first step” ? mogasp reply: See MoGASP’s third published goal, “A society where smoking is done only between consenting adults in private,” quoted in the next blog on the same topic, to be published shortly. To have constitutional rights you have to respect the health and well being of others. If your actions constitute a threat to others, your constitutional right to perform such an act are no longer valid. No one has a right to harm others. Tobacco smoke has been proven to be harmful for over 40 years. Smoking wherever others can inhale the toxic fumes is a harmful act. Your best course of action is to overcome your nicotine addiction. I did it 25 years ago and so can you. I am willing to help you. HEY! That’s the Godber [eugenics] Blueprint. It was a Blueprint established in the mid-1970s, years before even the first (1981) study on secondhand smoke. mogasp comment: Personally, I’ve never heard of the blueprint to which you refer, but by mentioning “eugenics,” you are clearly trying to unfairly impugn those seeking smoke-free air. It has nothing to do with eugenics, as a quick objective web search will reveal, e.g http://simple.wikipedia.org/wiki/Eugenics. Also, regarding a smoke-sensitive person enduring secondhand smoke at work every day exclaiming in public “I won’t let them poison my air,” it’s a sentiment to which I can relate, having had to endure it myself for years in order to keep a job in the U.S.
Dictionaries, unfortunately, provide a superficial definition of eugenics. Indeed, the breeding aspect is the major one and what eugenics is best known (notorious) for. However, eugenics also has a behavioral/environmental aspect regarding body “purity”. Its focus is anti-smoking/anti-alcohol, diet, and exercise. In this framework, tobacco and alcohol are viewed as racial/body “poisons” that must be eradicated, i.e., negative eugenics. mogasp reply: So we can’t accept a dictionary as a reference source anymore if you happen to disagree with it? Interesting viewpoint. MoGASP, where do you differ with Dr. Siegel on the issue of outdoor smoking bans? Also, Mr. Schock and Mr. Eastwood are receiving no compensation for their efforts to overturn the Clayton park smoking ban. mogasp response: I wasn’t aware that MoGASP’S stated goals differed from Dr. Siegel’s. It’s possible we may have an honest difference of opinion. Smokers already smoke in their own homes with impunity, putting other nonsmoking family members – including their children – at risk. How does what MoGASP supports make it worse? It doesn’t. If you’re correct about the attorneys, then they’re evidently doing this for publicity and nothing more. Many cities have been implementing smoking bans in wide-open outdoor spaces, like New York city which just banned smoking in all parks and on all beaches. My personal view is that these policies go way too far. I believe that in such places, nonsmokers can easily avoid exposure to smokers by simply moving away from them. If you think of a place like Central Park (where smoking is now banned), there is really no need to ban smoking in the entire park. Nonsmokers can easily avoid exposure to the smokers. Ironically, disallowing smoking in the parks may actually result in many more smokers congregating on sidewalks, leading to more exposure among nonsmokers. I also have a concern about the possibility that with increasingly aggressive outdoor no-smoking policies, many smokers may decide to start smoking inside instead, to avoid the hassles. That would not be a benefit to the public’s health if they are exposing other persons inside the home. My support for indoor smoking bans – including bans in all workplaces – is very strong. And I certainly support smoking bans outdoors where people cannot easily avoid the exposure (such as stadiums or outdoor restaurants where you have fixed seats and cannot simply walk away to avoid the exposure). But these widespread bans on smoking in wide-open areas are, in my view, going too far and they may not contribute to the protection of the public’s health. Mogasp, would you consider it fair that if Bill learned you were not getting money for you activities that he would come out and say “Well, MoGasp is evidently pushing bans for publicity and nothing more.” ? mogasp reply: There’s a world of difference between this attorney and MoGASP. Would you belittle Greenpeace because of its efforts to get publicity for its goals? Mogasp, your comment is dismissive, sophomoric, petulant, and disrespectful. You would need to read a few specialized volumes to get a handle on the philosophy, scope, goal, and underlying mentality of eugenics. You would certainly not get this from a wikipedia page: At best, it is a very basic introduction to the subject. Mogasp, you do understand that you can refrain from commenting when your opinion is non or ill-informed? mogasp reply: Your advice duly noted. Likewise we don’t have to approve every comment submitted to this blog, but we try to exercise tolerance of opposing viewpoints, illogical or not. LOL to MG and JA! :> And no MoGasp, I see no harm in GreenPeace or even in antismoking groups making proper efforts to get publicity for their causes. I *do* fault them for playing unfairly on primal psychological fears and drives (love for cute cuddly little things and for children or fear of death and pain), particularly when such plays are made regarding effects that are extremely unlikely or are made primarily in the context of advancing economic self-benefit, but I do not fault them for seeking publicity for their goals in and of itself. In terms of lawyers, one thing you should note is that those of us fighting smoking bans usually have very little or no money at all for our fights. If a sympathetic lawyer agrees to take on a case without recompense I certainly couldn’t fault him or her for doing it at least partly withthe thought that they might at least get some free publicity out of it. Has MoGasp never had a lawyer who helped out partly in their own self-interest? mogasp reply: As regards your final question, I can’t recall such a lawyer assisting MoGASP. I have a vague recollection of an attorney for a public interest group helping once, but I don’t recall the details and it wasn’t for her to get publicity. We’ve tried recruiting attorneys on occasion to help nonsmokers but never had success.